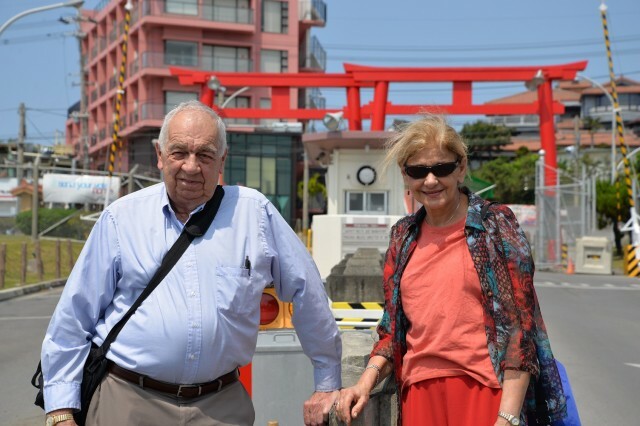 It's been 54 years since Bill Stanley last stepped foot on Torii Station, but April 13 he arrived in Okinawa and made his way to base to see it once again. "Well I've thought for 50-something years to come back, and here I am. We wanted to come back for nostalgia, to show our wives, to see how everything is," he explained. "You can see a lot of this stuff on the computer but until you're here, you don't get the same feeling." Bill and his brother, John Stanley, were stationed in Okinawa during the Vietnam War, both as telecommunications operators. The brothers and their spouses arrived at Naha Port on a cruise ship but an unfortunate medical incident en route to the island prevented John and his wife from joining. John Stanley joined the Army two years behind Bill, and attended the same military training as his older brother. "There was a warrant officer in my section and I told him 'Chief, my brother just joined the service and I think he's going to go to crypto school. It'd be great to see him over here.' Time went on, a couple months passed. All of a sudden, I'm asleep in the barracks and someone's shaking my rack. It was my brother," Bill said with a smile. John, originally on orders to Vietnam at the peak of the war, spent three days in Vietnam in a holding company when he received a change of orders to Okinawa. "He was a little upset; I think he wanted to be a hero or something, but we couldn't fight the north Vietnamese with a teletype machine." John promoted from private first class up through sergeant during his tenure in Okinawa, and was named the Soldier of the Cycle. Bill and John spent six months together in Okinawa before Bill was ordered back to the U.S. They enjoyed snorkeling together, as well as exploring the many caves near Torii Station. "There was all this bamboo growing up in the front of the cave and a little creek running in there. We went back in there really far. We had a flashlight and a big ball of string with us, we'd leave a trail so we wouldn't get lost coming back out!" They also enjoyed Koza, now Gate 2 Street, and spent time in Naha as well as visiting the teahouse at the August Moon where a U.S. movie had been filmed shortly after World War II. "It's hard to say if Torii Station has changed for the better, which I'm sure it has, but in my eyes, I still remember the old place," Bill said. "Going from Naha to Torii Station, it's so much more built up than it was, and the first open ground you see is when you approach Kadena Air Base. Highway 58 used to be Route 1 and we drove on the right hand side of the street instead of the left. Back then, the speed limit was 25 miles per hour (40 KPH) -- that was it. They ran the shuttle busses that stopped every place between here and Naha and of course that was free so if you didn't have your 19 or 20 cents for a cab, there was another alternative." Bill also noted that his old barracks building is now the JAG building, the NCO club that he regularly dined at or could purchase a $3 bottle of good whiskey is now the library, and the dining facility is now Havana's. "Of course we had to sleep most of the year under mosquito nets, and our barracks weren't air conditioned. We had to go to the PX and buy a fan with a stand, take it off the stand and get a coat hanger. You could hang it on the T-bar that supported your mosquito netting so you had this blowing on you all the time." After leaving Okinawa, Bill took a job at the National Security Agency for a year and a half then worked at a factory for three years. John took a job in heavy highway construction upon leaving Okinawa, and Bill later switched to working construction with his brother. Bill now resides in North Carolina with his family while John and his family live in New Jersey. Bill's message to the Soldiers and officers currently stationed in Okinawa is short and simple: "Make the most of your time in Okinawa. You'll never again have duty this good."